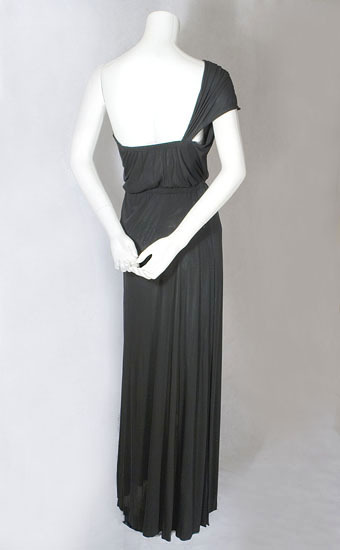 Commenting on the James Galanos exhibit at the Los Angeles County Museum in 1997, Bruce Hainley wrote: "What makes all this engrossing is seeing Galanos do things so stunning because so restrained and austere..."
Galanos' fashion background informs all his best work like this fabulous evening dress. He learned couture methods at the House of Robert Piguet in Paris. Galanos' natural theatrical flair was further developed by a stint in Hollywood for famed movie costume-designer Jean Louis. The term goddess gown derives from the classical depiction in sculpture of one-shouldered garments on goddesses to indicate their mythic identity; hence, the association of asymmetrical necklines with this cultural tradition. 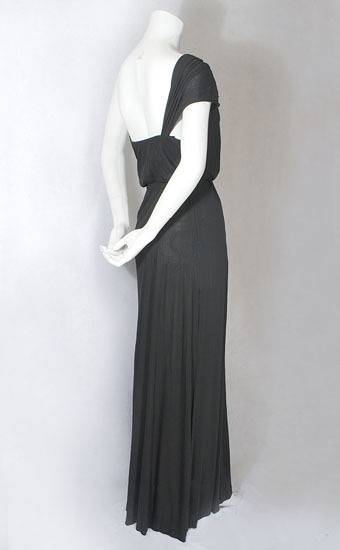 In this totally modern interpretation of the classic goddess gown, Galanos delights us with the unexpected. 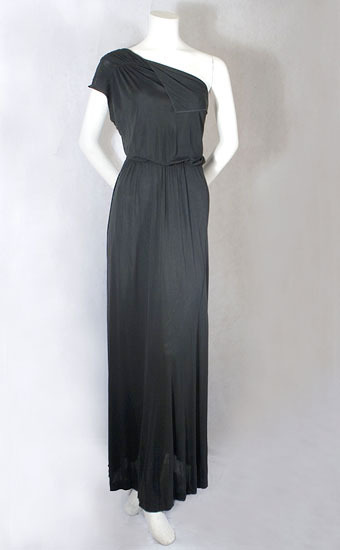 Goddess gowns are often rendered in silk chiffon, Galanos' trademark fabric. 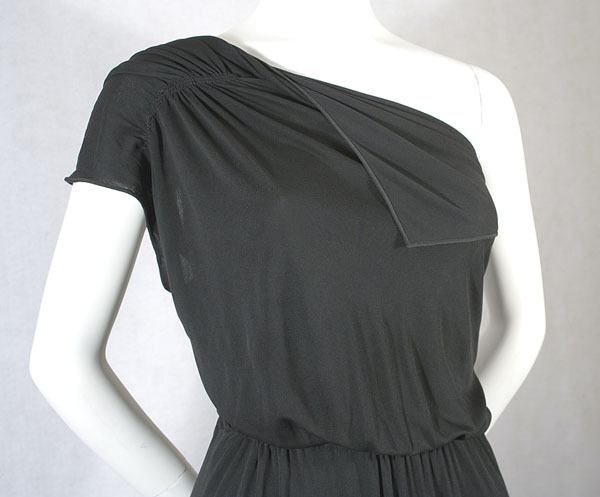 Instead, the designer chose black matte silk jersey, which molds to the body, requiring no inner structure. 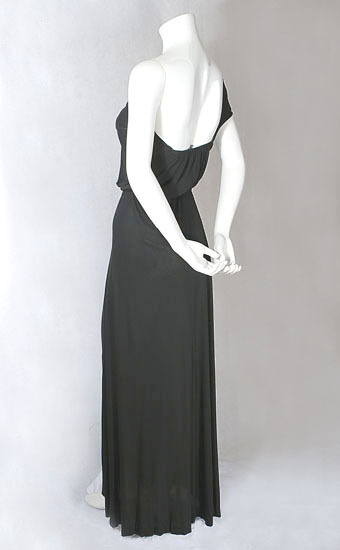 In a subtle reference to a great predecessor, Galanos drapes the black silk jersey around the body in the manner of Madame Grès. 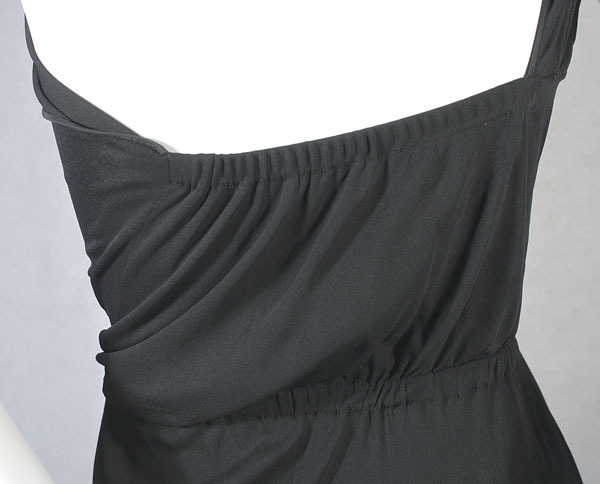 The	shape	and fit are both controlled with elastic at the waistline and bodice back. 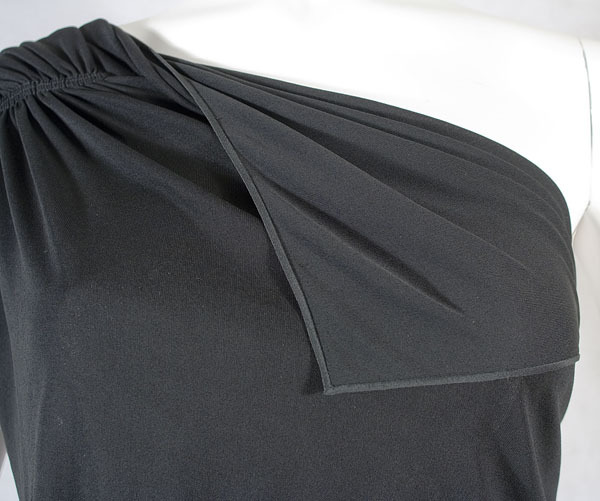 One quiet but elegant finishing touch reminds us the dress was made by this master of couture methods for ready-to-wear: the fold-over edge of the bodice front is bound with hand-stitched black silk—see the detail pictures below. 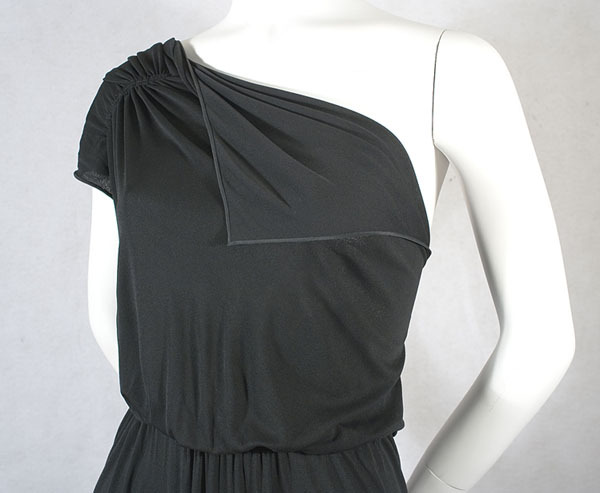 The dress, which slips over the head, is as easy and comfortable to wear as a T-shirt. The skirt is slit open on one side below the hips. The goddess gown goes back 2200 years to the Greek himation, originally a large straight cloak with some shaping. In Athens the himation was generally a modest garment, but as worn by a celebrated courtesan, like Pericles' consort Aspasia, the himation could be provocative. The Greek historian Herodotus correctly viewed distinctively Greek dress, like the himation, as a sign of Hellenic cultural authority. In its modern incarnation, the goddess gown plays a similar role, e.g., in modern couture (Grès, Fortuny, or Galanos). The condition is excellent. It looks like it was never worn.